This weekend, most of us will undoubtedly watch the IIMA Romantic comedy – “2 states”, and yes, we should. It does seem to be well made, and the story by Chetan Bhagat was quite fun. It is probably the first romance set up in an IIM to be made into a Movie! No second thoughts about it, it would in all probability be very well worth the time spent. How many of us would see this one? “Manjunath.. Idiot tha Saala” is the real story of Manjunath Shanmugam, an alumnus of IIM Lucknow batch of 2003. He was posted as a Sales Officer in Bharat Oil, Lakhimpur Kheri, UP. On a chilly November day in 2005, he was shot dead for daring to raise his voice against the system and it’s corruption. Following the murder, there was immense media spotlight on the case. Manjunath’s batchmates from IIM Lucknow (where he was affectionately called Machan) also kept the story alive. The incident inspired several students at IIM, IIT and other educational institutes culminating with the IIM students setting up the The Manjunath Shanmugam Trust. Of course, the movie does not have big stars backing it, but it is one film made with all heart and honesty. It is the culmination of the efforts put in by the alumni of IIML, and countless other people who toiled hard to bring the perpetrators to justice. This is one story that we should ensure gets maximum eye balls, to know how an innocent fun loving guy is trampled to allow illicit gains at the expense of the public at large. 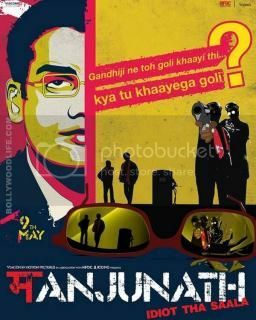 Through the lens of Manjunath, it shows the dark underbelly of the nexus between different powers to be, and how it is all collectively destroying the fabric of the country. Why young people entering into the workforce would be forced to become corrupt! Are we looking at a future mired with corruption and sub-standard way of life? So, who is coming along on 9th may? This is Quite a Fabulous Article which is Written and Go through media in a Large Scale.Nice Story and Focuses on The Development of the country. Strong Ethics and Highlighted on the Stages of Corruption.